Faceted amethyst nuggets, ametrine irregular shape chip nuggets and polymer clay lentils by Kamoe Clay. 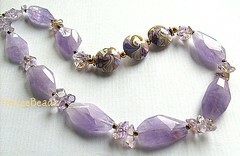 Soft lilac with just a hint of gold. Measuring approx 18" this ends with a toggle.